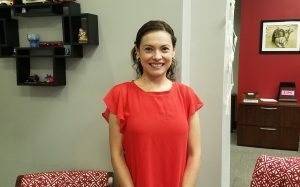 When Melanie Walker’s husband got a job as an associate professor of educational psychology at The University of Alabama in August last year, they packed up and moved from their home in Durham, England, to Tuscaloosa. But while he worked, she was left alone and unable to pursue her own career because for now the type of visa she was given doesn’t allow international spouses to work. With this not being her first international move due to her husband’s career, she quickly found ways to occupy her time and get involved. One of those ways she discovered was UA’s International Spouse Group, where she is now a co-leader. “My husband and I saw the group on the website and I saw where they met and when, and I turned up one day to say hello and I was welcomed in,” she said. The International Spouse Group brings together the spouses of international students, faculty, staff and scholars for activities and interaction by learning from each other and sharing unique knowledge and experiences, according to its website. The home countries of current group members include Nepal, Brazil, Uganda, Bangladesh, Japan, England, the Netherlands, Germany and America. The group is open to American spouses who want to make international friends and support those friends in the process of acculturation. The current American in the group, co-leader Kay Geno, is from south Louisiana and has been a member for a year and a half. She said she joined because she was new to Tuscaloosa and sought fellowship. She also wanted to help non-Americans acclimate. “What I hope happens is that the camaraderie that they feel makes them understand that they aren’t the only ones who feel like they’re going through this struggle,” she said. Geno said group members generally have a lot of cultural questions, but also questions about how to properly conduct themselves in America. “They ask things like, ‘how do I address someone in an email?’ ‘How many times should I call someone?’ They want help navigating through health care, purchasing a house, which of the 50 brands of toothpaste to buy, what cleaning supplies. The group also visits local and state hot spots. Geno said the largest contingent in the group are spouses of graduate students. The group meets each Wednesday during the school year from 10 to 11:30 a.m. in the International Student and Scholar Services offices in 105 BB Comer Hall. To become a member of the International Spouse Group, simply attend a meeting. For more information, email Uofa.isg@gmail.com, or join their Facebook page. When Angelique Umutoniwase was five years old, the Rwanda genocide terrorized her country. The genocide, which took place from April 7-mid July, 1994, resulted in more than 800,000 deaths. As Umutoniwase described it, the killings are officially called the 1994 Genocide Against Tutsi. Some of Umutoniwase’s family members were victims of the the genocide. After the tragedy, she and her two sisters survived by staying together. Umutoniwase said she lost other family members because of the killings, also. After the genocide, the sisters stayed in orphanages. Umutoniwase said children and adults were split up throughout Rwanda. The Rwandan government tried to help victims after the genocide. However, it was not enough, Umutoniwase said, and the entire country had to start over from scratch. A commemoration of the genocide will be held in Washington, D.C. on April 7, the day the genocide began in 1994. This will be the Rwanda genocide’s 25th anniversary. The University of Alabama’s Capstone International Center will sponsor Umutoniwase’s first trip to the Rwanda genocide commemoration. For Umutoniwase, the commemoration will serve as a way to learn from the past. Annual commemorations are held in Rwanda from April 7-13. After that week, an honorary three months of remembrance takes place. This period is in observance of the three months the genocide spanned. “The purpose of the commemoration is to make perpetrators learn that they did the wrong thing,” Umutoniwase said. Survivors like Umutoniwase will use the annual commemoration as part of their healing process, she said, and in her case, the University is supporting her trip. “Because Angelique was really directly affected by the Rwandan genocide, we felt it was important for us to support her in being able to attend the commemoration event,” said Teresa Wise, associate provost of international education and outreach. The University has been involved with Fulbright since the program was established in 1946, Wise said. 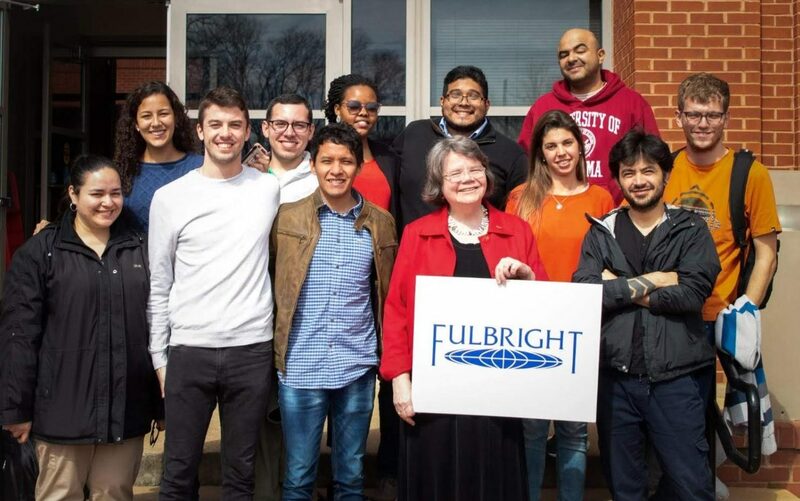 Wise said the Fulbright Commission receives funding through the U.S. government’s state department. The Fulbright Commission came into effect as an agreement between the United States and the United Kingdom based on educational values across nations. Wise oversees the international outreach operations for the Capstone International Center. The UA English Language Institute (ELI) is included under that umbrella. Currently, Umutoniwase is studying with the ELI, and she said she is the only Rwandan student in the ELI and Fulbright program at the University. 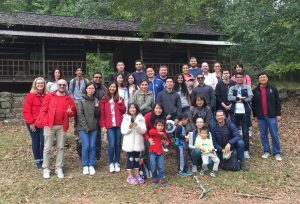 “A big part of our mission is to serve as a gateway for international students into The University of Alabama into degree programs,” said Bill Wallace, director of the ELI. Wallace said the ELI has been on campus since 1982. “We help recruit international students, help them get ready in terms of their English proficiency and readiness to be undergraduate or graduate degree-seeking students,” Wallace said. According to the ELI website, the program offers a year-round, six-level intensive English program for international students. These six courses start at a beginner level and finish at advanced. Wallace said there is no specific time frame that students need to finish their ELI courses in. Umutoniwase is currently at level six, the advanced level. After her time with the ELI, Umutoniwase plans to attend graduate school. Before that, however, she must make a sufficient score on the Test of English as a Foreign Language (TOEFL). Umutoniwase will study civil engineering with the Fulbright program. After her time at the University, Fulbright will sponsor her graduate degree in the U.S.
“I just gravitate towards civil engineering,” Umutoniwase said. Fulbright gave Umutoniwase the chance to come to the University to improve her English before she pursues her graduate degree. One of Wallace’s hopes is that more international students attend the University and feel welcomed on campus. “When Angelique comes back, I hope we’ll have some kind of report or presentation from her about her experience there [at the commemoration],” Wallace said. For Umutoniwase, it is important for students and Americans in general to learn about Rwanda’s history. Education Abroad Advisors Raven McKenzie and Sarah Kidwell and International Student & Scholar Advisor Chris Larkin were inducted into the NAFSA Academy for 2019-20. 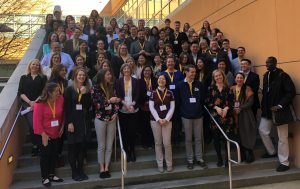 The current Academy class of 61 trainees and 11 coaches met in Atlanta, Georgia on the Georgia Tech campus, where they spent an energizing and intense four days broadening their knowledge of the international education field, participating in 5 knowledge community based workshops, convening evening roundtable discussions, and connecting with a community of International Education peers. The Academy for International Education is a selective program, in which trainees are provided foundational training around nine international education professional proficiencies and the primary knowledge areas of international education. The foundational training is enhanced by a personalized learning plan the Academy trainee develops, which guides and measures the trainee’s learning throughout the Academy year, in addition to individualized coaching from a international education coach. The William P. and Estan J. Bloom Award honors a student who has improved relations among different groups. Past recipients have been chosen primarily for improving understanding and supporting interaction among groups for a common cause. Sakina Dhondia finds that bringing people together for festivals – or even just coffee – can help UA students connect in ways they could not otherwise. Thanks to her work with the International Students Association and as director of cultural experiences and diversity for the Honors College Assembly, she helped arrange activities, including the International Coffee Hour, the Diwali festival and the Crimson Culture Gala, that inspired interaction among the diverse student body of UA. Dhondia, a finance and economics major, moved with her family from Delft in the Netherlands and now lives in Tuscaloosa. She has served as treasurer, vice president and president of the International Students Association, as well as a design partner for the Design for American project and budget director for Night to Shine, an Honors College initiative that creates a prom-like experience for students with special needs. She also works with the Alabama Transportation Institute. Her parents are Juzer and Rashida Dhondia. From – 2019 Premier Awards. 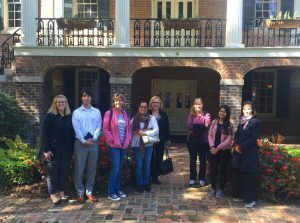 This semester the English Language Institute (ELI) at UA welcomed ten Friends of Fulbright students from Argentina, as well as six Fulbright Long-Term English Placement students from Colombia, Mexico, Panama, Paraguay, Rwanda and Venezuela. 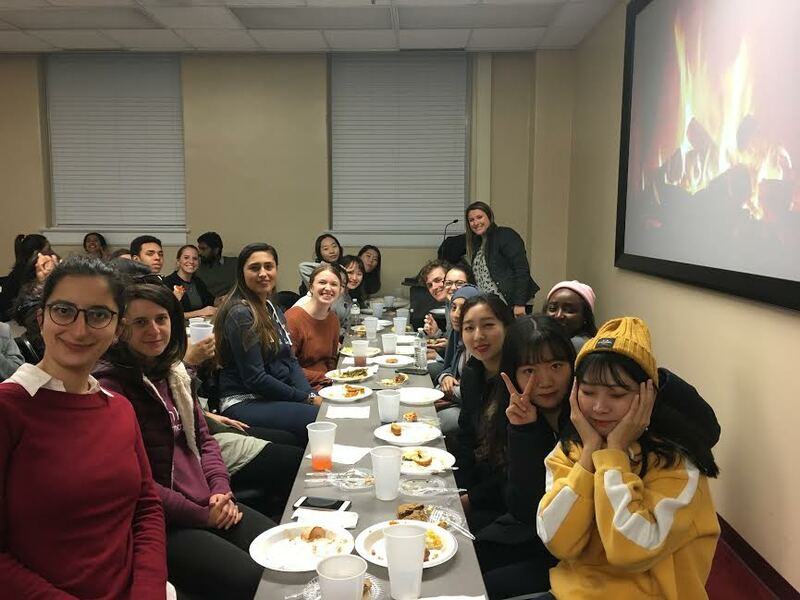 The Friends of Fulbright students take nine hours of English instruction per week and observe three University of Alabama classes related to their majors. The goal of the program is for students from Argentina to gain familiarity with attending U.S. universities and experiencing life in the U.S. In addition to classes, the students participate in cultural activities on and off campus. These students plan to pursue graduate degrees after completing their undergraduate studies in Argentina. 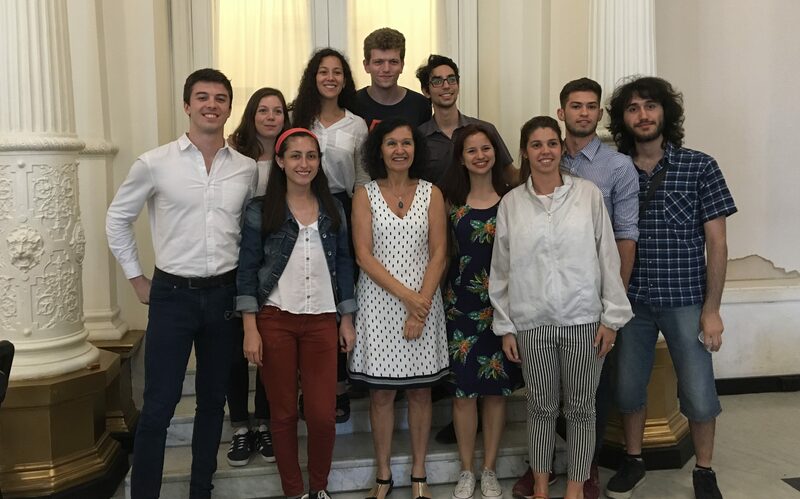 The Fulbright Long-Term English Placement students came to the ELI to improve their English language skills while seeking admission to U.S. university graduate programs. The students are enrolled in 20 hours of English classes per week and participate in seminars and cultural activities. The ELI is pleased to partner with the Fulbright organization to support international exchanges. In early January the Education Abroad staff collected UA’s new international exchange students from the Birmingham, Alabama airport. The University of Alabama is excited to host seven new exchange students and eight returning exchange students this spring. These students come from institutions in Italy, Australia, Scotland, France, Japan, Wales, England and China! They spent their first day in Alabama driving to Tuscaloosa and checking into their on-campus housing, as well as making other necessary trips through their new college town to get them fully settled-in. 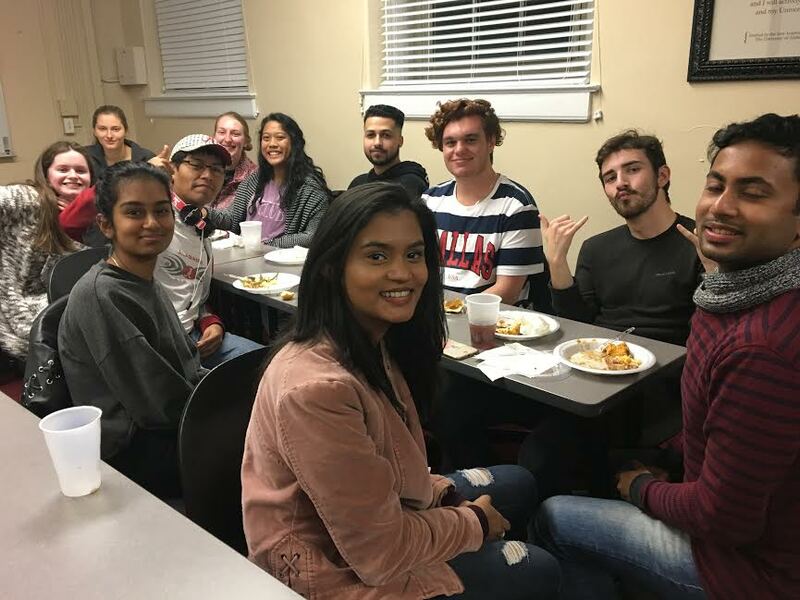 The majority of exchange students stay in an internationally focused on-campus housing program, which offers a small co-ed atmosphere for international students and other UA students who are interested in interacting with students from other nations. For an authentic American experience they ate lunch at Buffalo Wild Wings, an American sports bar and restaurant. The Education Abroad staff enjoys introducing the exchange students to sweet tea, fried pickles, and ranch every semester. 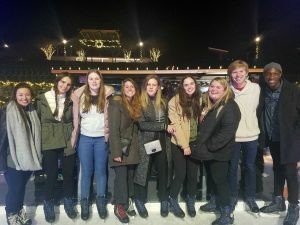 Exchange students enjoying the ice rink in downtown Tuscaloosa. The exchange students are always welcomed to The University of Alabama with an international student orientation where they are taught the classic fight song and taught how and when to say Roll Tide so that they can be accustomed to using it every day. The Capstone Men and Women spent an afternoon introducing the students to the beautiful campus and surrounding areas. The students really enjoyed getting to know campus and the staff even learned some interesting new fun facts as well. All together, we had a great day that concluded with a run to Target, because who doesn’t love Target? Exchange students seeing Bryant Denny stadium for the first time! 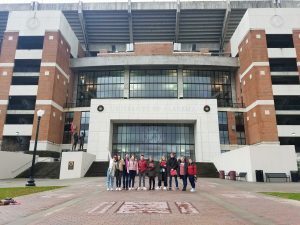 The University of Alabama Education Abroad office also takes our exchange students on regular monthly expeditions and events. In the past, events such as trips to the Huntsville Space and Rocket Center, going to see a play in Birmingham, having dinner at local restaurants, and cooking a classic homemade Thanksgiving dinner have been educational and fun. 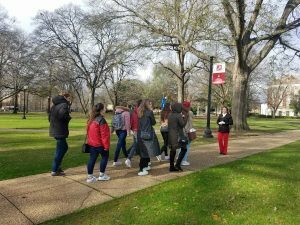 A campus tour led by a Capstone Woman. 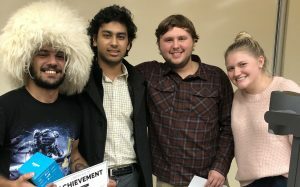 English Language Institute student, Javanshir Huseynli, won the Best Solo Hack prize at The University of Alabama’s Local Hack Day last Saturday, December 1. The Local Hack Day, hosted by GitHub and the UA Association for Computer Machinery, is a hackathon which allows participants to create and complete interesting computer programming projects within a 12-hour time limit. Javanshir worked from 9:00 a.m. to 9:00 p.m. to program an Android app that allows local guides to connect with tourists. He was one of 40 participants in the competition who submitted their work to be judged. As a reward for his hard work, he won an Amazon Echo Dot. Javanshir Huseynli is a Global Undergraduate Exchange Program (Global UGRAD) scholarship recipient from Azerbaijan. He is finishing his second session at the English Language Institute, and in the spring semester will attend UA computer science classes. He is working towards an undergraduate degree in mechatronics and robotics engineering. Javanshir is shown here wearing a traditional hat from Azerbaijan. Congratulations to this session’s ELI Tuition Scholarship winners: Rudy from Colombia and Xiaoyang from China! Rudy works at a local bank in Colombia. She told us that, “The U.S. is the best option to learn English because of the quality of education, which is known worldwide.” She is also interested in learning about American culture. 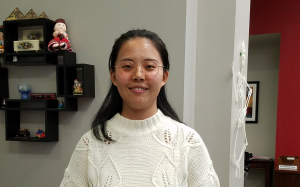 Xiaoyang will be a doctoral student at The University of Alabama after completing her studies at the ELI. Every session the ELI awards tuition scholarships to current full-time students. The students must attend 80% of their ELI classes and have a minimum GPA of 3.0 in all ELI classes. Students must also write a short essay explaining why they want the scholarship. If you are a current ELI student and want to apply for a scholarship for next session, you can find the application on the ELI Forms page.